As Jess struggles to take care of her depressed mother, and Lucas takes up boxing under the ever-watchful eye of his overprotective parents, their paths converge. They slowly become friends and then something more, learning to heal and move forward together. But what does it mean to love after an unspeakable tragedy? You might have noticed I have a very specific “type” when it comes to YA contemporary: if it isn’t tragic, I probably won’t like it, but if it can yank at my heart strings and make me cry (and maybe rage) a few times? Well, that’s my idea of a good time. Given how Amy’s last release Now is Everything destroyed my entire life for days after I finished it, I had high hopes for this story, and wow, did it deliver. Amy Giles is flawless when it comes to these gut-punch, heart-wrenching contemporaries that I can’t help but carry with me long after they end. I have to wonder if other people find some measure of comfort in being around survivors of a shared tragedy. Because I sure as hell don’t. 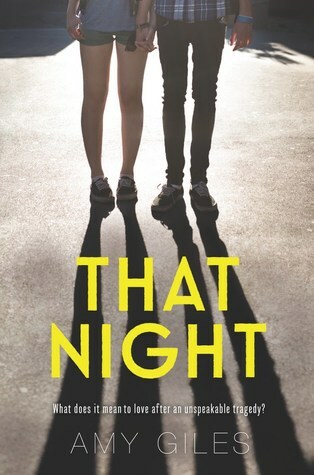 That Night picks up a year after a shooting in Queens, where we follow two protagonists—Jess and Lucas, both teens who each lost a big brother in the tragic event. Their similarities basically stop there, though; besides their grief, their reactions and the ways their lives have changed since that terrible night couldn’t be more different. I miss my mother as much as I miss Ethan, if not more. What we really see a difference in is how each teen’s families have reacted: for Jess, her father had exited her life before her brother’s death, and now it’s just her and her mother. Her mother suffers from such extreme grief and depression that it’s a fight to convince her to even eat or get out of bed, and Jess finds herself being forced to keep the household going while attending school. We watch Jess function as this pragmatist who’s doing everything on her own, doesn’t know how to accept help from anyone, and honestly, it’s a wonder the poor girl can even stay afloat. On the other side of the coin, there’s Lucas, whose loving parents take care of him, keeping him in therapy and even encouraging his newfound love of boxing to work through his stress and grief. His mother has become this helicopter parent who feels the need to do everything for him and expend all of her energy on keeping him as safe as humanly possible, and when you compare her to Jess’ absent family, it depicts this juxtaposition that is actually devastating. There’s a scene in which Jess is interacting with Lucas’ mother that has me literally choking up while writing this review, because it’s just so painful to watch Jess go through life alone, and I know I’ve said it a million times, but Amy Giles is so good at breaking my heart, I swear. But what if we’re just that, two broken pieces that end up jabbing and hurting each other and everyone around us? Honestly, what else can I even say? It’s one of those stories that’s really character-driven, and you have to read it for yourself to experience it. Watching these teens and their families slowly heal, knowing that there’s an empty space in their lives now that can never be filled, but might be soothed, at least, by this sweet, timid relationship blossoming between Jess and Lucas—it’s heavy, it’s impactful, and it’s wonderful. I can only imagine how she was going to finish her thought. One last thing, though—trust me when I say that the grief in this book is drastic, and heavy, and tangible. I cried so many times while reading this because my heart was breaking for these poor families. What killed me the most, besides how badly Jess needed her mother, was her mother’s behavior in the first place. As a mother myself, I can only imagine how easily the loss of a child could put someone into a tunnel so dark, they couldn’t fathom finding a light at the end of it. It’s not okay that she checks out and leaves Jess all alone, but I can’t say that I don’t understand it. This is one of those stories that I know I will carry with me for such a long time. There are shootings here in the US so often, and we’ve lost so many young lives in recent years. It can be easy to think of those numbers as statistics, but Amy Giles’ storytelling reminds me that each person lost had a family who’s been left to mourn them. I only hope that I’ve somehow managed to find the right combination of words to convince anyone reading this review to pick up a copy of this book, because Amy’s stories are worth it. I hope she never tires of writing these tragic, beautiful contemporaries, because I will never tire of reading them. All quotes come from an advance copy and may not match the final release. Thank you so much to HarperTeen for providing me with this ARC in exchange for an honest review! My daughter is currently on a theater crew for her high school’s production of 26 Pebbles by Eric Ulloa. The play deals with the Sandy Hook Elementary school shooting where 26 children and adults were gunned down. I have had my daughter text me from her hiding spot during lockdown for an active shooter on campus (not what any parent ever wants), so I’m thinking this book is one I should pick up to help me better understand what victims and their families go through as well as cope (or not). Excellent review! Thank you! It’s such a great book and I really recommend her debut novel as well! This sounds like such a powerful read! There’s nothing quite like a book that tugs on your heartstrings, makes you really think, and stays with you once you’ve finished the final page. I’m definitely putting it on my TBR thanks to your review!